TPS2 LED luminaires from Hydrel use a dedicated optical system and internal electronic ballasts and drivers to deliver enhanced light output for outdoor lighting applications. The luminaires feature a more compact, axial design that allows light to weave into decorative displays and other floodlighting applications. 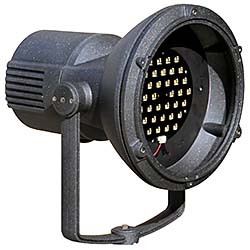 They can replace 50-150-Watt, high-intensity-discharge floodlights. They feature a robust diecast housing, a durable powder-coat finish, an infinite-adjustment taper lock yoke design, and six LED precision NEMA distributions as well as internal and external glare control options.